Are There Any Coal Stocks Worth Buying? Investing in the coal mining industry doesn't have to be a dirty word. Investing in coal mining stocks seems like a futile pursuit at the moment. Despite a pricing rally and recovery in the share price of the remaining coal miners that haven't gone belly up, the industry's future still looks stark. Coal used for energy production in the U.S. has been especially hard hit. The list of miners that have gone under over the past few years is long and growing longer as its end market is on the wane. 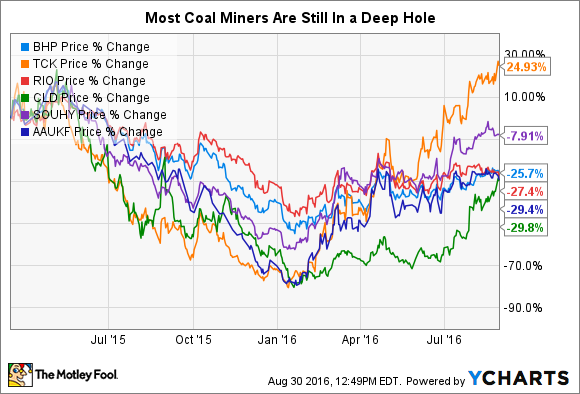 Cloud Peak Energy (NYSE: CLD), for example, may have more than doubled in value over the past six months, but there were fewer than 500 coal-fired power plants operating at the end of 2014, down from 625 a decade earlier. And the Energy Information Administration says between January 2015 and April 2016, nearly 20 gigawatts of capacity has been retired with another 5.6 gigawatts switching over to natural gas. The future of the U.S. coal mining industry looks bleak as environmental regulations, cheap gas, and tough foreign competition sap miners' strength, but there may be international coal stock opportunities still available. Image source: Getty Images. Tough new environmental laws; plentiful, low-cost natural gas; and competitive coal supplies from foreign coal-producing countries mean, at least broadly, that the coal mining industry will continue to face a difficult path forward. But if investors widen their lens a bit to look at the industry globally, things improve a bit. China is not only the world's largest coal producer, it's also still the largest consumer, and its recent cutbacks in production has caused the prices of both thermal coal and metallurgical coal to rise in recent periods. Indeed, the latter, which is critical for the steel industry, made its biggest move higher in five years last week, and prices are now up 73% from the multiyear lows they hit in February. Data source: Company SEC filings. *FY2015. While China still presents risks as it transitions its industrial base to a more consumer- and service-oriented economy, not to mention its commitment to renewable energy sources, those are long-term structural changes, meaning coal will continue to play a significant role for the foreseeable future. Where best, then, to invest? As has been the case for most industries, China will continue to be the straw that stirs the drink for coal. BHP Billiton is by far the world's largest producer of coking coal that's publicly traded on the U.S. exchanges, though it's looking to India, not China, as the engine that drives the sector. The miner says it will cut costs by 20% over the next year while targeting $600 million in productivity gains even as it boosts output. Teck is the second largest seaborne exporter of steelmaking coal in the world, with Asia accounting for approximately 70% of its annual coal sales volume. While those two coal producers would be appear to be the best bets for investors wanting to invest in coal mining stocks because of their size and financial stability, they are not pure plays, and Teck, with its heavy reliance upon iron ore -- another key steelmaking component -- would be more vertically integrated and thus more subject to the volatility the industry will assuredly endure. Although Anglo American (NASDAQOTH: AAUKF) has been a major coal producer, it is exiting the market and has put its Australian coal mines up for sale after taking a $1.2 billion writedown on them over the first six months of the year. The biggest U.S. players in coal were driven into bankruptcy; those that remain are in a much weakened state. Investors then would do well to look overseas for the best opportunities for capitalizing on the long-term need for coal to drive the growth of emerging economies.